Vazhakunnam Neelakandam Namboothiri:- Known as the Grand Father of Magic in Kerala. He gave a new meaning to magic in kerala. He played an important role in bringing Magic as an Art. For more than half a century, he had kept the onlookers spellbound in spite of his extreme simplicity, and devoid of any elaborate stage and costume. He was born on Makeeram star on 26 Makaram, 1078 (08-02-1903) in Vaazhakunnath Mana in Thiruvegappura, to Raman Atithiripad and Narippatta (Karalmanna) Mahal, Arya Pathanaadi as the fourth son. Raman Atithiripad, popularly known as Vaazhakunnam Ateeri was famous for his wits.After "Othu" (committing Vedam to memory), he learned Sanskrit at Guruvayur from his brother, Vasudevan Nambudiri (scholar and expert on discourse), and English from Pattambi Narayana Iyer. Though he had a yearning earlier to learn magic after having watched some tricks shown in his Illam by one Mundaya Eachara Varier, his stay at Guruvayur kindled in him tremendous interest about elephants and studied "Maathangaleela" under an expert, Kochunni Thampuran of the Kodungallur royalty. 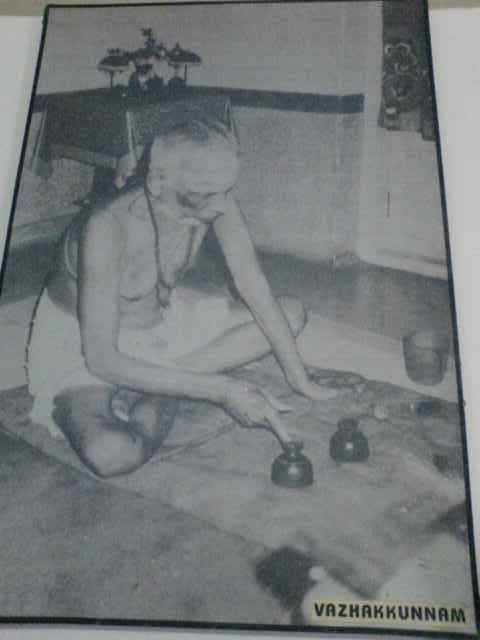 While there, he happened to watch "Cheppadividya" [tricks using Cheppu (cups) and Panthu (balls)] peformed by Pallatheri Nambyathan Namboodiri (vide 2, below) an expert and scholar by any standard, and his interest in magic was re-kindled. With the permission of his master, he switched to learning Jaalavidya under this Pallatheri. Vaazhakunnam later became famous for Kayyothukkam, although occasionally he performed also "Cheppum Panthum" (cups and balls) to small family gatherings. Gradually he mastered other modern magic tricks also. He learned "bullet" tricks from the renowned magician Bekkar of Alappuzha and taught him Cheppum Panthum in return - as Guru Dakshina. He became adept in card tricks from Alli Kittan (Alli Krishna Iyer). He used to put all his little gadgets in a bag when he visited Illams and Kovilakams, and if pressed upon, would show a few items, particularly those based on Kayyothukkam, always captivating the on-lookers. Once in a while, depending on the audience, he would show the "bullet", "tying upon the cross", "guillotine" and other technology-oriented tricks. Though he did not consider hypnotism and mesmerism as part of pure magic, there were occasions when he had to do such tricks under pressure. He was famous for his disappearing act (Mooti Vidya). There were many instances where, after performing a trick, he would even show how it is done, saying that with practice, anyone could do it; such was his humility. It was after 1940 that he started real stage performances with his troupe. Apart from magic, the shows included short dance programmes, comedy skits, etc. With him was Paryanampatta (Kunchunny Nambudiripad) who was already a well-known actor and Vaazhakunnam's disciple in magic. After 1948, he modified his shows including costumes. He would start with a two-line prayer (his own creation) and a Gandhi Sthuthi, being a true Gandhian. He would start from very simple tricks and proceed to more complicated ones. He was unmatched in "producing" any number and almost any size of different articles apparently from nothing. At some point, he and P C Sircar (Jr) met, and ever since they had tremendous mutual respect. In his old age, Sircar visited him at home and gave him a cycle rickshaw and in return received a sword. Most later magicians considered it fortunate to be Vaazhakunnam's student. Apart from Paryanampatta, those trained by him include the late Manjeri Ali Khan, Prof: Muthukad, R K Malayath, Joy Oliver, K P Krishnan Bhattathiripad, Kuttiyadi Nanu, K S Manoharan, K J Nair, Vadakkeppad Parameswaran, Raghavan, his own sons and others. He had married K C Anujathi Thampuratty of Kottakkal Kovilakam (d: 1980) and have two sons and a daughter. The elder son, late K C Aravindakshan Raja (d: 1998) was a magician, while his brother, K C Thulasidas Raja, though a high school teacher, is known as Junior Vaazhakunnam and has been staging magic performances. Vaazhakunnam's daughter K C Sumathy is married to the writer-poet P M Narayanan (Panjavur Mana). The only time he could not keep an appointment on stage was in 1983 at Kasargod, but that was because on the 9th of February that year he disappeared for ever from the magic (and real) world! .His Contribution towards Magic is written in golden letters.